SIX CONTRADICTIONS IN LAUDATO SI' - Only now can I offer my readers an analysis of Laudato si’ (LS) by Pope Francis released on June 18, 2015 (signed on May 24, 2015). It will not be an exhaustive analysis, as I made with Evangelii gaudium (here, here, here and here), but just a list of the contradictions I noted in it, incongruities that, in my opinion, should never be in a papal document. As we all know, there is a difference between the spiritual sphere and the temporal sphere in society, as the realms are ruled by different authorities. 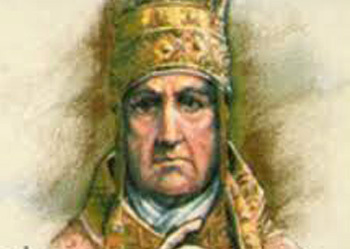 Although there are mixed matters on which both spiritual and temporal powers should agree – e.g., marriage, education, customs, arts – a Pope should restrain himself to speak on matters proper to his sphere. The matter of recycling waste § 22 / the use of fossil fuels § 23 / what the level of discarding used material should be § 27 / wasting water §§ 28, 29, 30 / the loss of forests § 32 / the replacement of virgin forest with plantations of trees § 39 / the question of converting swamps into cultivated land § 39 / the best forms of fishing § 40 / urban chaos & the poor transportation in large cities § 44 / the export of raw materials § 51 / the pollution of rivers § 51 / the use of air conditioning § 55 / the style of secular buildings and apartment blocks §§ 113 / the commercialization of diamonds and the fur of endangered species § 123 / the genetic modification of plants §§ 131, 133 / the relationship between biological science and the economy § 132 / the domestication of animals § 133 / the function of scientific-technical language § 143 / the noise level and ugliness in cities § 147 / regulations for urban planning (design of buildings, neighborhoods and public spaces) §§ 150, 151 / the problem of traffic congestion, highway construction & parking lots in cities § 153 / the forms of industrial production with maximum energy efficiency § 180 / defining today's financial bubble § 189 / dictating norms on the use of paper & plastic; food consumption; the use of public transportation and home electricity § 211. 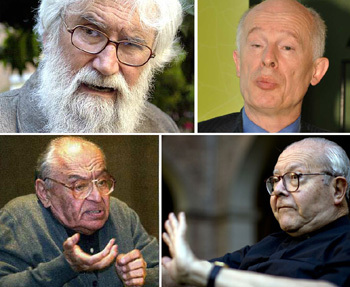 Before the publication of LS, a group of Catholic NASA scholars went to Rome (here, here and here) to present serious scientific data showing how baseless the propaganda is on global warming spread by environmentalists, socialists, communists and partisans of Liberation Theology. Neither the Pope nor the Vatican received them. Both disregarded the scholars’ arguments as irrelevant. In LS, Francis took a partial position by assuming leftist bogus science as the base for his encyclical (cf. §§ 15, 23, 24, 41, 48, 165, 169, 170) and came to dramatic consequences, which are consequently unjustifiable. LS, thus, is in frontal contradiction with what serious scientists affirm. 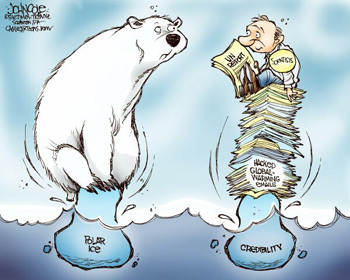 Besides its general bias, LS becomes fraudulent when it affirms: “A very solid scientific consensus indicates that we are presently witnessing a disturbing warming of the climate system.” (§ 23) There is no such consensus; global warming – part of the agenda of the UN and Liberation Theology – is a theory that is increasingly being denied by the facts. The attacks of Pope Francis against Capitalism are very frequent and radical in LS. He calls it “a system of commercial relations and ownership which is structurally perverse” (§ 52); further on he calls the period of capitalist rule “one of the most irresponsible in History” (§ 165). He also affirms that “the present world system [Capitalism] is certainly unsustainable” (§ 61); and estimates the financial system as “a power which has no future” (§ 189). Other attacks against Capitalism in LS can be found in §§ 5, 6, 16, 26, 31, 36, 38, 50, 54, 56, 59, 61, 82, 134, 144, 159, 162, 175, 184, 190, 195, 198, 203, 204, 209, 219. Notwithstanding his harsh critique, what Francis affirms is that Capitalism produces much more food than necessary to provide for all, including the 1/10 of the world population that, according to the official statistics, suffers from hunger. The excess food produced today could most probably provide for all the poor including that large part of this hungry population who live in communist countries – China, Russia, Vietnam, North Korea, Cuba etc. However, in the ensemble of LS, Francis upholds the very essence of Communism, which is the attack against inequality and private property, the promotion of the universal distribution of land and goods, as well as the encouragement of class struggle. Promotion of class struggle: §§ 30, 38, 50, 51, 90, 95, 114, 154, 179, 181, 204, 206, 207. In six passages of LS, there are good words attacking abortion directly or indirectly (cf. §§ 29, 50, 117, 120, 123, 136). The entire document, however, is turned toward promoting the UN and its agenda of establishing a One World Order (cf. §§ 14, 53, 143, 164, 167, 170, 173, 174, 175, 207). Now then, everyone knows that to establish this Universal Republic, the UN for decades has worked for birth control all around the world by promoting the mass sterilization of women, all kinds of contraceptive methods and, finally, abortion. I do not need to say that all these methods are against Morals. 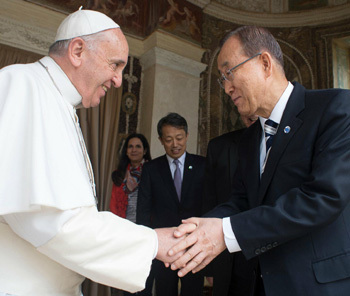 So, by promoting the UN, Pope Francis indirectly undermines Catholic Morals, particularly regarding abortion. When LS boldly attacks Capitalism, it defends small producers and regional economies, as well as local cultures (cf. §§ 129, 134, 144); it also defends the sovereign States as they exist today (cf. § 177). “The 21st century, while maintaining systems of governance inherited from the past, is witnessing a weakening of the power of nation states. … Given this situation, it is essential to devise stronger and more efficiently organized international institutions, with functionaries who are appointed fairly by agreement among national governments, and empowered to impose sanctions. “As Benedict XVI has affirmed … : ‘To manage the global economy; to revive economies hit by the crisis; to avoid any deterioration of the present crisis and the greater imbalances that would result; to bring about integral and timely disarmament, food security and peace; to guarantee the protection of the environment and to regulate migration: for all this, there is urgent need of a true world political authority.’” (§ 175). Now then, the UN’s aim is to establish a Universal Republic where the small producers, local economies and cultures, as well as the sovereignty of the States, will be eliminated. These are the six major contradictions I observed in my reading of Laudato si’. In the various reviews of it that I read, I did not find any, so far, that pointed to the ensemble of these contradictions. This article is meant to fill the lacuna. In conclusion, the guidelines of Laudato si’ are to curse Capitalism and bless Communism according to the latest version of Liberation Theology, whose banner now is Ecology. The key document that expresses the ideal of both the UN and Liberation Theology is the Earth Charter, duly endorsed by Francis in LS (cf. § 207). The Pope also insists on a utopian miserablist lifestyle, which rejects any luxury or pleasure, for all mankind without exceptions. All this, presented in a quite poor intellectual form and with a remarkable absence of logic. Who Is Inspiring Francis on Ecology?